The three rats snoozing in Cage 57 don’t know it, but they could someday help save thousands of human lives. Snuggled in their EcoFresh bedding, the rodents are digesting a meal that may hold clues to preventing colon cancer, the second-leading cause of cancer deaths in the United States. 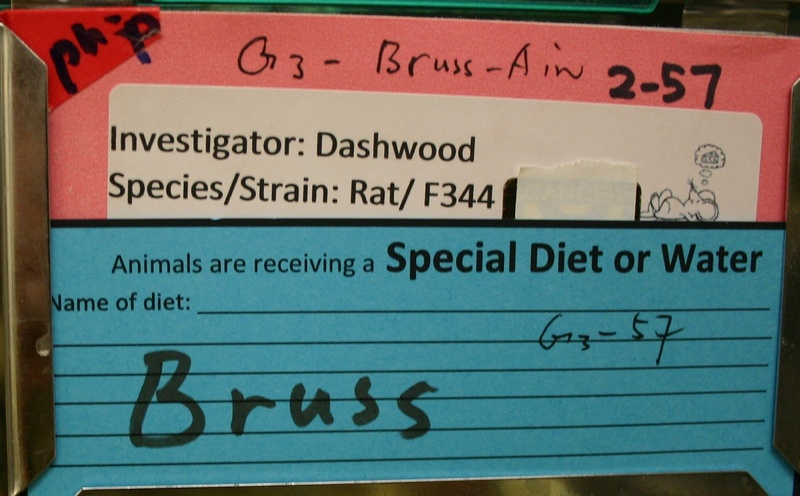 On their cage, equipped with HEPA air-purification filters and precision temperature controls, hangs a blue index card labeled “Special Diet,” on which a researcher has scrawled “Bruss” in black felt pen. The scrawl is short for Brussels sprouts, those oft-disparaged veggies resembling tiny cabbages that are loaded with promising cancer-prevention compounds such as sulphoraphane. To the rats, however, the pale-green pellets in their food tray (Mix AIN93 from Research Diets Inc., with sprouts added) are just dinner. 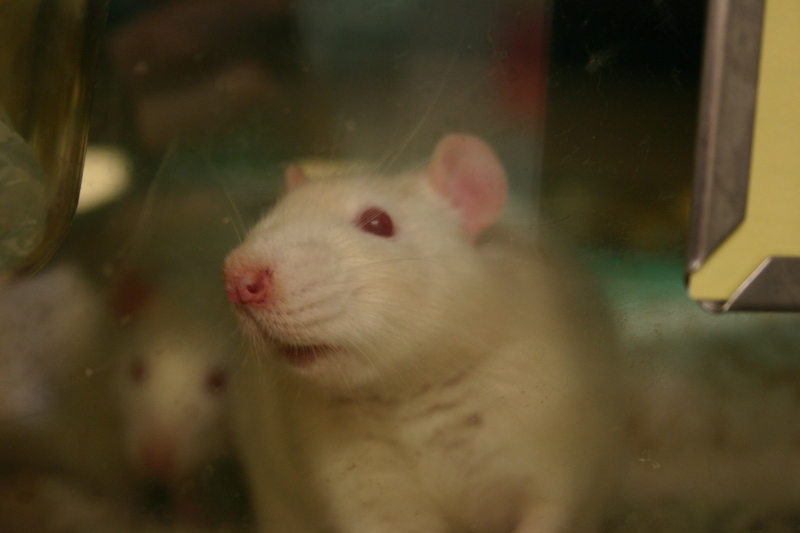 That dichotomy — the rats’ bodily, mental and social needs (rodents are housed with “buddies” for company and “crawl tunnels” for enrichment) versus the precise methods of science — requires researchers to walk a tightrope, always balancing the pressing questions of medicine, for example, against the welfare of animals. The results are key to curing devastating diseases like ALS or Alzheimer’s. Oregon State University, with 600,000 research and teaching animals (mostly fish and other aquatic species) at 30-plus sites across the state, is balancing those interests exceedingly well. That is the judgment of the Association for Assessment and Accreditation of Laboratory Animal Care International (AAALAC), which in March gave a glowing report after an extensive accreditation study (see “High Grades for Animal Care“). Oregon State is the 19th among the nation’s 71 land grant universities to earn full-campus AAALAC accreditation. 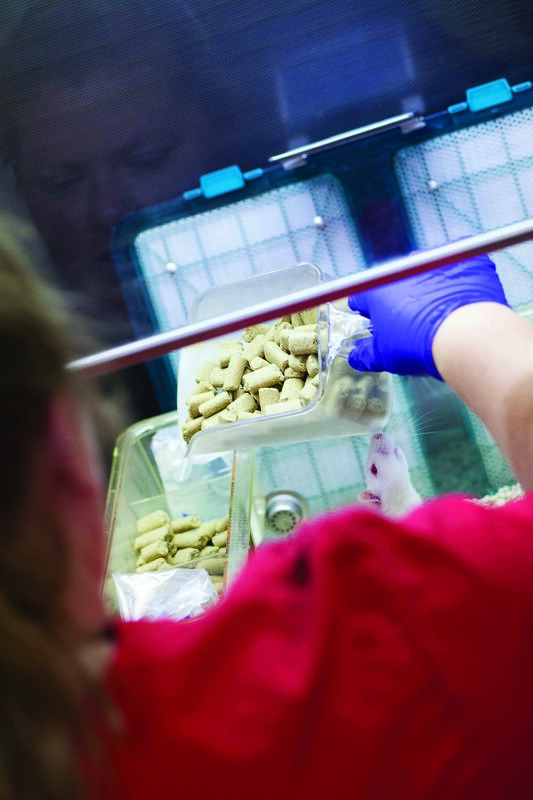 The snow-white, sprout-eating rats in OSU’s state-of-the-art rodent facility are just one among 400 vertebrate species that populate the university’s labs, barns, aquariums, ranches and hatcheries. Zebrafish, steelhead, beef cattle, garter snakes, rainbow trout, dairy cows, yellow- and red-legged frogs, copper and canary rockfish, lambs, koi, swine, salmon smolts and llamas are among the half-million-plus warm- and cold-blooded creatures that help educate OSU’s students, improve health (both human and animal), protect ecosystems, guide resource management, bolster local economies and engage the public. Every last one of these creatures, from the 2-inch trout fingerling to the 2,000-pound Hereford bull, is the responsibility of Dr. Helen Diggs. If you don’t have an electronic key card, you must knock at a security door to gain admittance to her building on the west end of campus, the base from which Oregon State’s attending veterinarian oversees her vast menagerie. With the welfare of thousands of animals on her mind, she is quick to question, slow to trust (or, as she likes to say, “I trust but verify”). It’s a hyper-vigilance honed over 25 years in the field, some of those years at UC Berkeley where Diggs endured threats from animal-rights activists and had to be escorted to her car by security guards. How lambs, preemies, “death cap” mushrooms and research pigs steered a stellar career. So when a hamster is lethargic or a horse is lame, she’s on it. But practices haven’t always been so rigorous in the world of animal research. Diggs has been in the field long enough to have seen the transformation. This laxity was not just a problem for the animals. It was also a problem for the science. Adds Steve Durkee, another of the university’s leading research-animal watchdogs: “If rats in one study are getting cereal while those in a second study are getting oranges and M&Ms, you can’t compare the results of the studies. 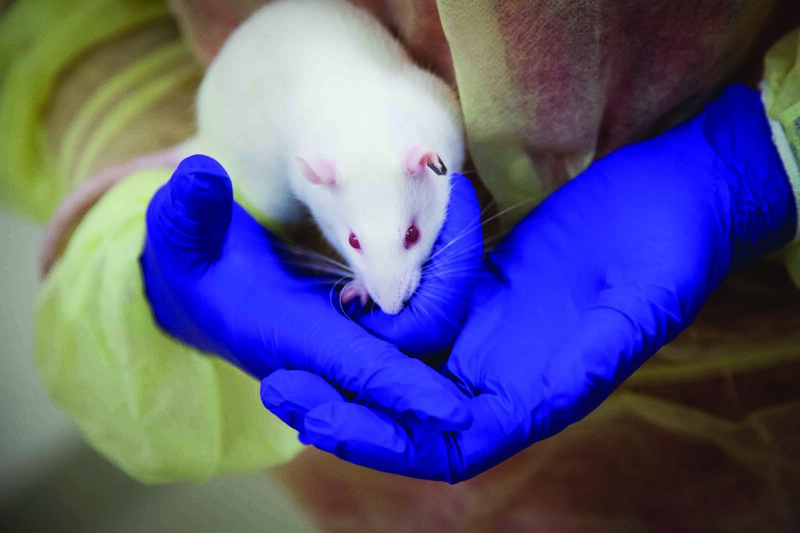 By standardizing and harmonizing how animals are cared for, you create consistency across labs and institutions.” In fact, he notes, prestigious academic journals publish only findings that document the highest standards of animal care. That’s why Diggs’ job has teeth. Sharp ones. Even though the U.S. Public Health Service mandated in the early ‘70s that all animal research institutions hire an attending vet, the top docs didn’t have any real enforcement power until the mid-‘80s. That’s when the National Institutes of Health and the U.S. Department of Agriculture cinched up the rules for labs getting federal research dollars. Bob Murray waves his key card in front of a laser-triggered security panel in the $62.5 million, 1-year-old Linus Pauling Science Center, which houses the Department of Chemistry as well as the Linus Pauling Institute. The elevator opens, and he steps inside. One floor down, he flashes his card again, clicking open an electronic steel door into a small anteroom, where he slips on a gauzy yellow “isolation gown” and a pair of puffy blue booties. For a third time, Murray brandishes his key card, unlocking yet another heavy door. He enters the inner sanctum of Oregon State’s gleaming “vivarium” — the small-mammal equivalent of an aquarium or a terrarium — where hundreds of rats and thousands of mice live, as well as a few hamsters. Not one of these furry beings can get a sniffle or a sore toe without Murray knowing about it. The vivarium maintains strict controls on temperature and other factors in the animals' environment. Murray’s dad worked for the Society for Prevention of Cruelty to Animals in Boston for nearly 30 years. So worrying about animal welfare is practically in his genes. He takes pride in the life-saving research he has observed over the years, like the groundbreaking Herceptin research at Genentech that is being used to treat thousands of women with breast cancer and the malaria vaccine research at Walter Reed. Still, it’s the health and comfort of the whiskered rodents that gets him out of bed every morning at 5 o’clock and keeps him running as he oversees his team of highly trained, certified animal technicians. If Murray were to take you through the 8,000-square-foot facility where researchers investigate the links between nutrients and human health, the first thing you would notice is an obsession with cleanliness. The giant Steris cage washer (which he calls “the heartbeat of the whole facility”) sanitizes racks of cages in two cycles of 180-degree, pressurized water — and that’s after the cages have been blasted with detergent and rinsed in acid. Everywhere you look, technicians and student workers are prepping cages for incoming animals or plying mops on floors that already look immaculate. Viruses and bacteria that could sicken the animals and compromise the research don’t stand a chance. The next thing you would notice is the attention to precision. Automated lighting simulates 12 hours of day, 12 hours of night. Electronic monitors maintain a 68- to 72-degree temperature range. An alarm alerts the staff if temperatures fall outside the range by even 1-degree Fahrenheit. There are ventilation tubes, fume hoods, stainless-steel work stations illuminated with stretchable spotlights. Every last facet of the facility is designed to protect the health and welfare of all its mammalian inhabitants, human as well as rodent. Not until you reached the bosom of the vivarium would you come upon the rodents. The Brussels sprout-eating residents of the “rat room” were born and raised at an Indiana-based research-animal supply company called Harlan Laboratories, arriving at OSU in ventilated crates via UPS. Firms like Harlan, along with Charles River Labs, Jackson Labs and dozens of others comprise a global mega-industry in the service of science. All must adhere to the same stringent federal requirements that guide OSU’s animal-care personnel. Diets supplemented with cancer-fighting compounds are under investigation in the Linus Pauling Science Center. In the rat room where Rod Dashwood and other researchers in the LPI Cancer Chemoprotection Unit are looking for evidence that cruciferous vegetables like Brussels sprouts and broccoli sprouts can block the formation of colon tumors, dozens of clear-plastic cages are stacked, one above another, inside tall metal racks like high-rise condos. When you lean close and peer inside, you’re likely to get a visual jolt. The cold, hard sterility of biomedical science is, you realize, wrapped around hundreds of breathing beings with whiskered snouts and beating hearts. They cuddle together for warmth and companionship. They look out at you with the pinkish eyes characteristic of albino Strain F344, understanding nothing about the scientific enterprise in which they play the leading role. So why do scientists work with animals? What can rats (Rattus norvegicus) or zebrafish (Danio rerio), seemingly so far from Homo sapiens on the tree of life, reveal about human health and disease? Turns out, many basic biological processes such as cell division, organ differentiation, gene mutation and disease formation play out similarly across species. That’s why a rat or a mouse or a fish can act as a stand-in for a human in studies on micronutrients, obesity, aging, ALS, cancer, drug efficacy, infectious disease and any number of other biomedical questions under investigation at Oregon State. With lives on the line, there’s no room for nonchalance. When researchers use rats, mice or other species to study processes that mimic or parallel human biology, they call it a “model.” One common model is a “knockout mouse.” It works like this: To gauge how certain genes affect certain bodily functions or disease processes, researchers “knock out” or silence the targeted gene and then study what happens when the mice get, for instance, a high-fat diet or a hormonal supplement. Knockout mice are used at OSU to study bone growth, aging, obesity, immunodeficiency and many other intricate areas of human health. But complex animals like mice and rats are used only when there’s no other way to investigate the question at hand, Durkee stresses. Indeed, basic biomedical research begins with cells in a test tube. Only after experiments have shown great promise do scientists advance to animal work. And then, only after the animal studies achieve high rates of treatment success or cures — along with low risks for harm — do scientists go on to conduct experiments on humans. Steve Durkee’s mother was a subject in one of those experiments, which researchers call “human” or “clinical” trials, when she was battling breast cancer. Durkee likes to direct people to the AAALAC website’s long list of Nobel Prizes in medicine and physiology over the past 110 years. Without the use of lab animals, Frederick Banting and John McLeod wouldn’t have discovered insulin and the mechanism for diabetes, winning the Nobel in 1923. Alexander Fleming, Ernst Chain and Howard Florey wouldn’t have discovered penicillin and its curative powers. Typhoid and yellow fever would still be raging across the land. But Banting and McLeod’s methods with dogs, rabbits and fish probably would fail to pass muster with today’s regulating agencies. It’s not only federal regs that have changed — it’s the moral, philosophical and ethical sensibilities of Americans toward creatures of all kinds. Oregon State biomedical ethicist Courtney Campbell has seen a sea change over the past decade and a half. "Nothing is more important in an animal study than the animal itself," says Steve Durkee. In the rat room, the “Bruss” eaters live alongside the “brocc” eaters (broccoli sprouts) and the “fat” eaters (high lipids). There’s a control group, too, which eats regular rat chow. That’s so Dashwood can compare the health impacts of an ordinary diet against those of the special diets. At the study’s start, all the animals were injected with the carcinogen found in charred meat — a known cancer-causing compound to which most Americans have been exposed in barbequed burgers or grilled steaks. Once the study is over, the animals will be euthanized, humanely, in strict accordance with the protocols set out by the American Veterinary Medical Association. The researchers will then compare the number and size of colon tumors among the four groups to find out whether eating sprouts made a difference. Editor’s note: Read more about Oregon State’s leadership in animal ethics in the Winter 2013 Terra.